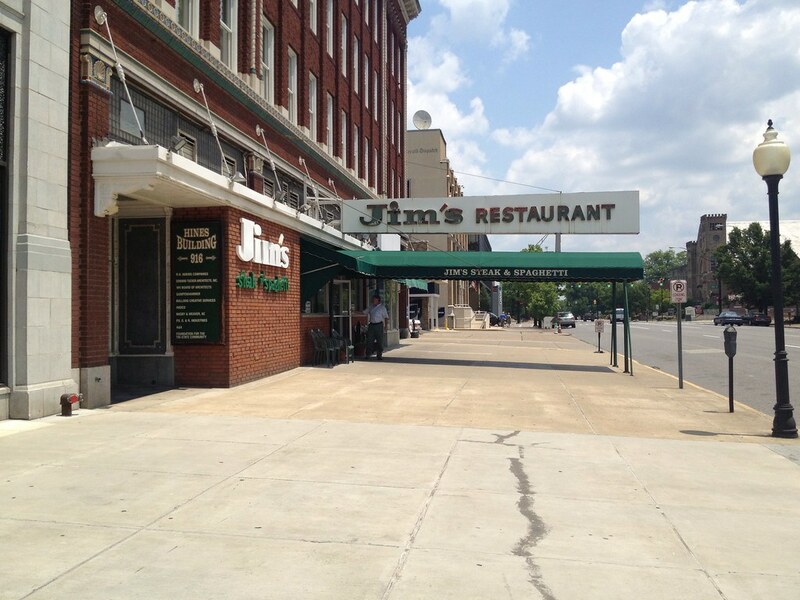 Jim's Steak and Spaghetti is one of those iconic Huntington restaurants that you just gotta try. And I've heard my fair share of Jim's being entirely overrated, so I was hesitant. But whenever someone downplays a restaurant, I think my propensity to like them increases. 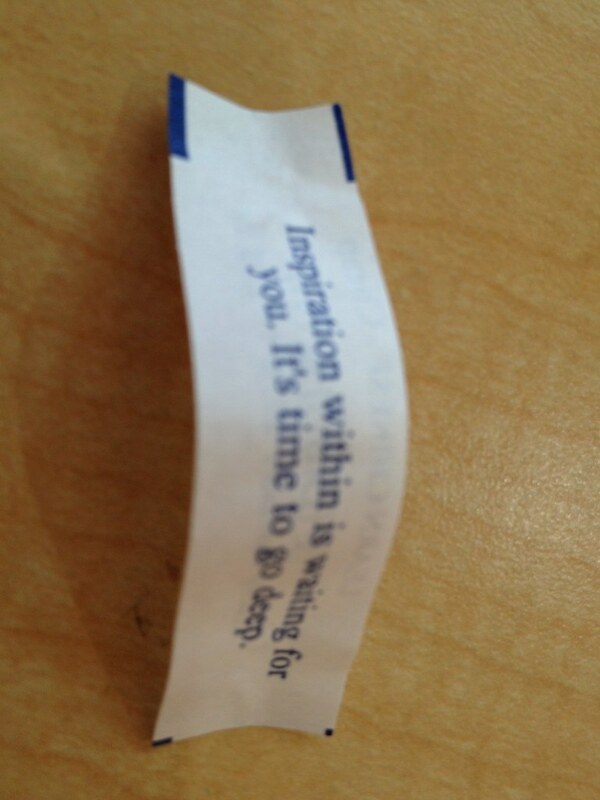 The inverse is also true - don't talk up a restaurant to me, or my expectations will be entirely too high. After an assignment one day, my photographer friend and I were starving. We walked in and a waitress seated us at a green booth. 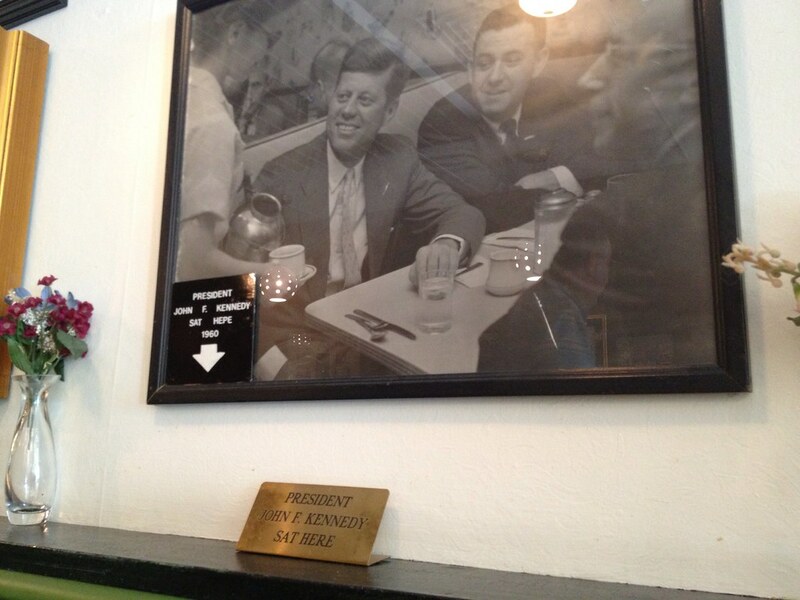 It just so happens that President John F. Kennedy sat in that very booth. And they're very proud of it. 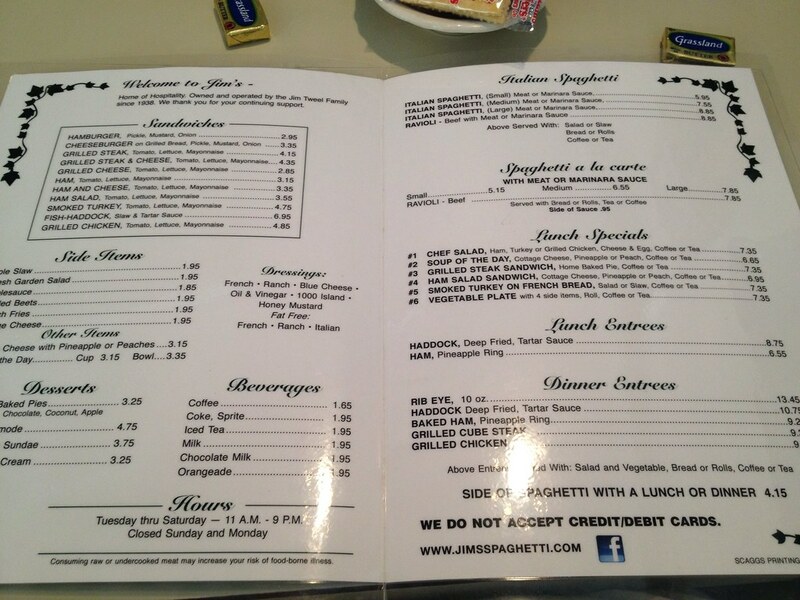 The menu features Italian fare and some "dinners" - steak, ham, fish. I ordered a small spaghetti. It came with a small salad (I ordered French dressing). It wasn't too busy this particular day. Our food came out fairly quickly. My salad was basic, but crisp. French was out of a packet, but I'd rather they give me that than no French at all. I was actually surprised at how small the "small" spaghetti was. 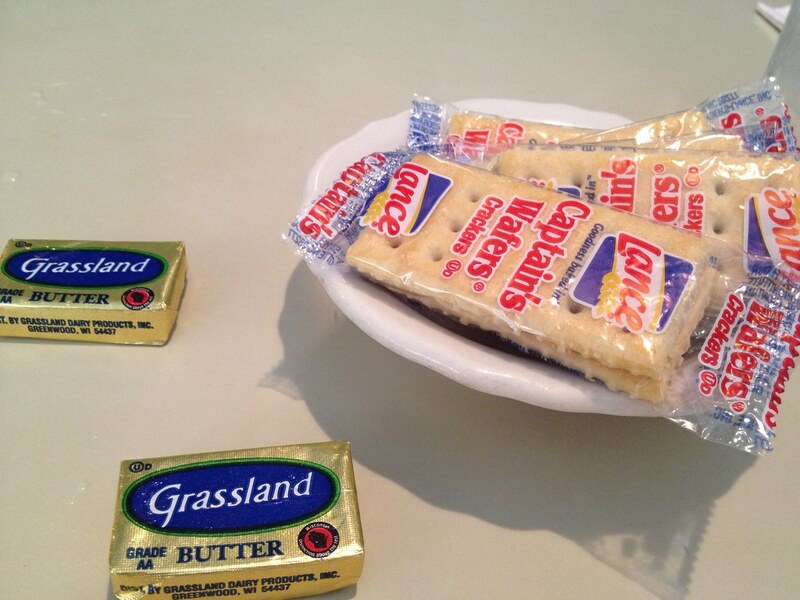 Granted, I really didn't need much for lunch. But I didn't want to risk a large spaghetti. Anyway, it was good enough for this day. 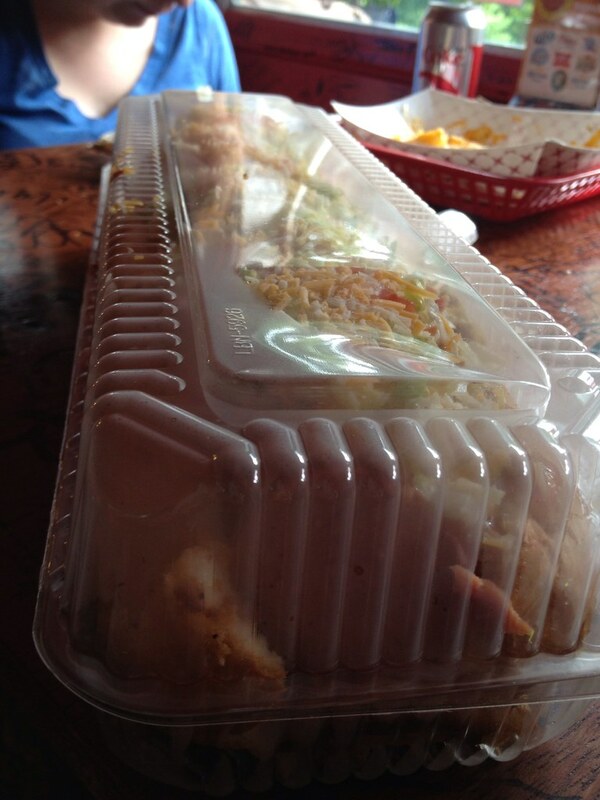 If you're bringing an appetite, you might want to get the large. I know some folks aren't huge fans of the sauce, but I liked it. While many say it's capitalizing on the past or its reputation, I think the food is actually good. 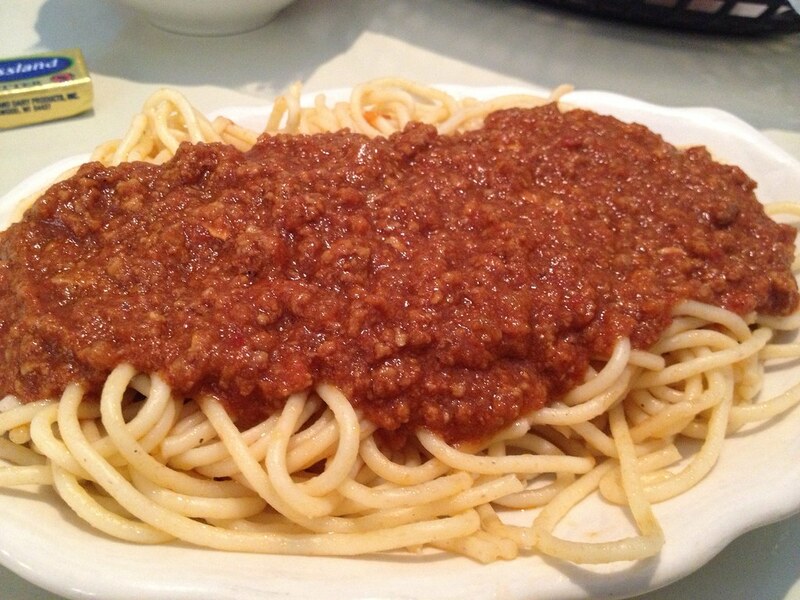 It reminds me of spaghetti my grandma made. The sauce is cheap. 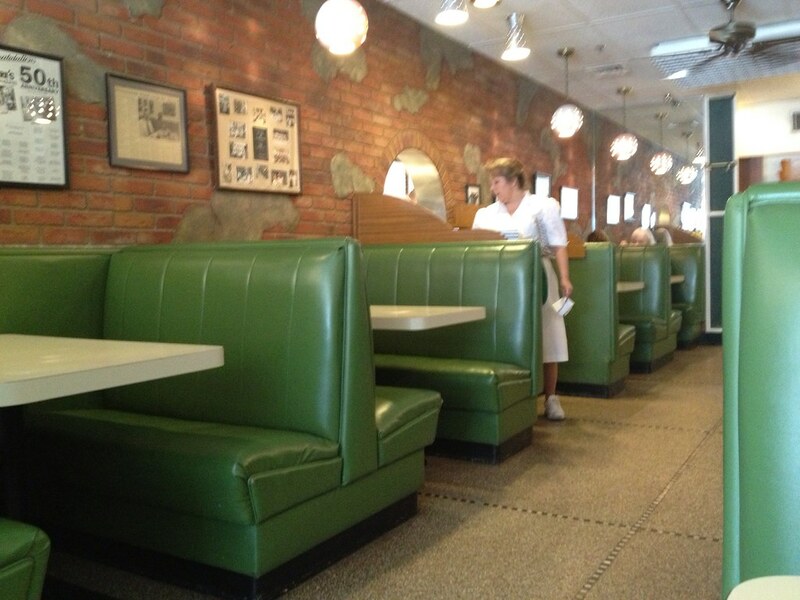 It's nostalgia for me - not for the restaurant - but for that type of food. And I missed it. The sauce doesn't have a great depth. It's salt, pepper, garlic with some ground beef in a ketchup-based sauce. It's good. 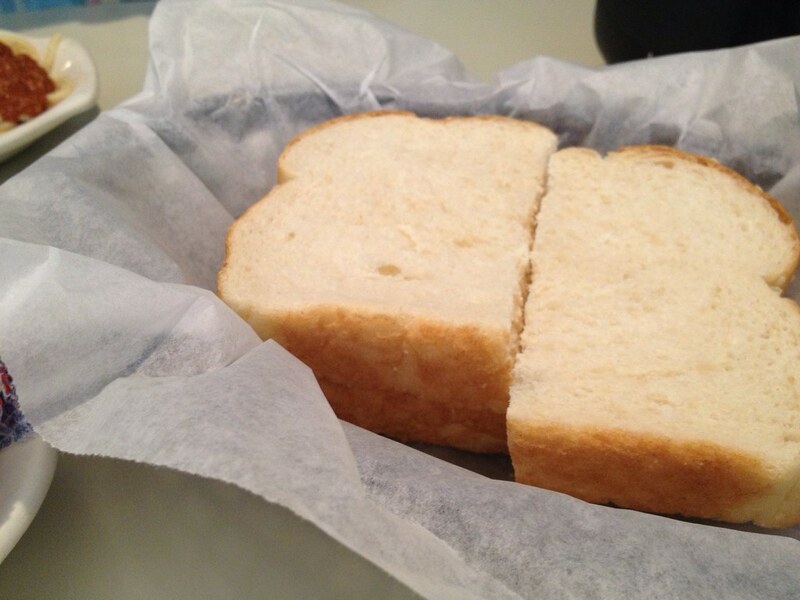 I also got a few slices of bread and butter to go with the dish. Reminds me of home. Love that. 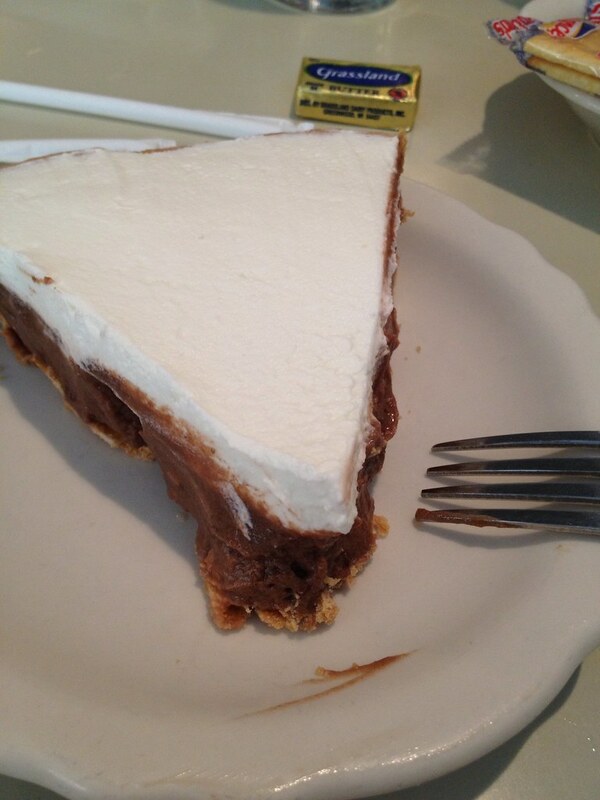 I wish I had been there for strawberry pie week, but alas, I settled for chocolate. Settled, ha. It was delish - indulgent. It's essentially pudding with a whipped topping and a crust. So lovely. The worst part about this place is that it is cash or check only. There is an ATM there, so it's convenient. 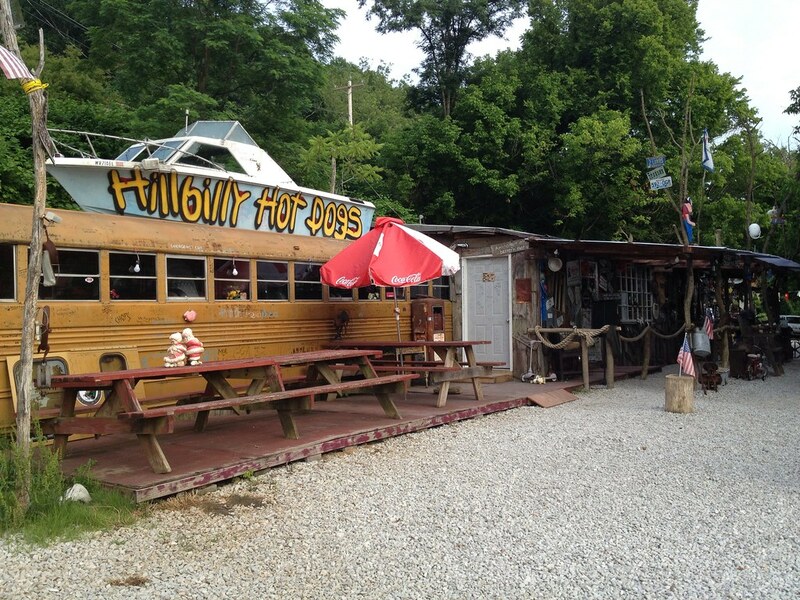 Regardless, it's one of those places you gotta try. It's a classic. 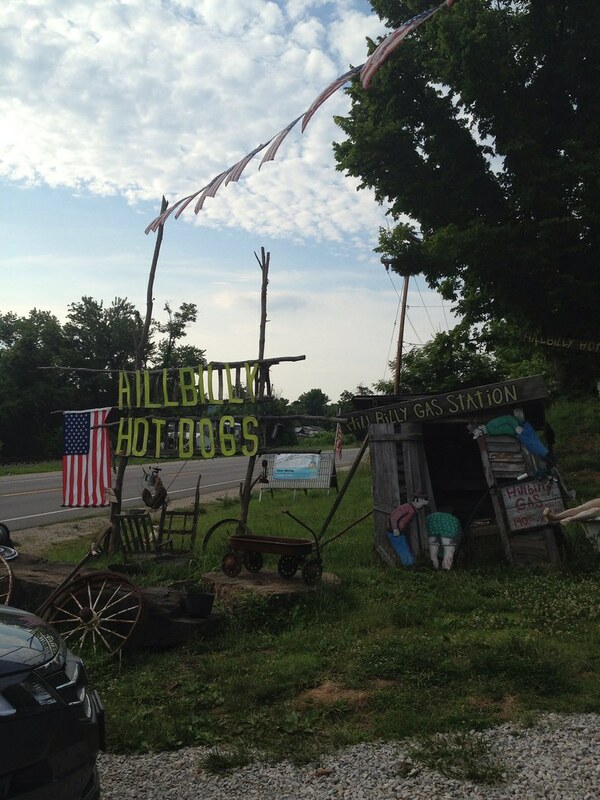 Probably the most popular hot dog stand in West Virginia - whether warranted or not - is Hillbilly Hot Dogs. 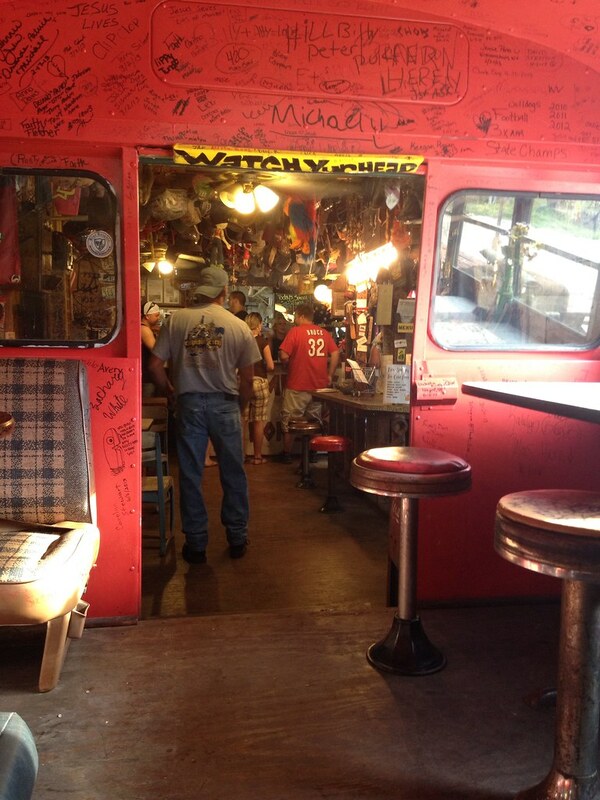 This fame is probably due to its um, interesting decor that has warranted attention from Diners, Drive-Ins and Dives and others. 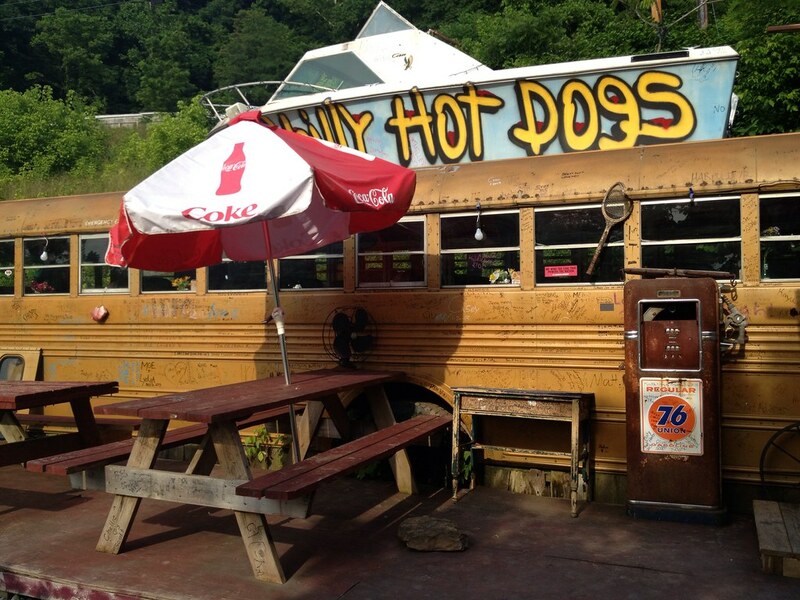 There are a few locations, but the original - complete with buses to dine in - is in Lesage, just outside of Huntington. You can tell there's a lot going on when you don't notice the bus in the tree when you first pull up (guilty). 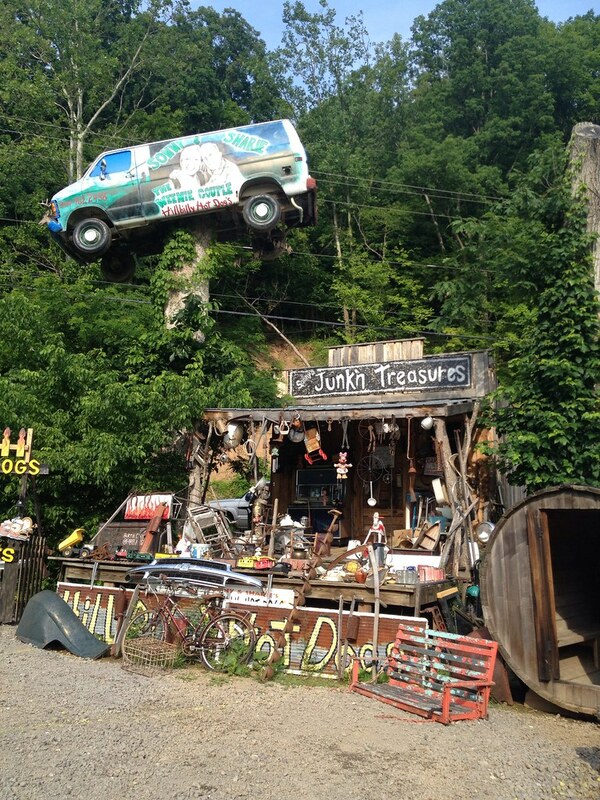 This place is full of junk. Really. 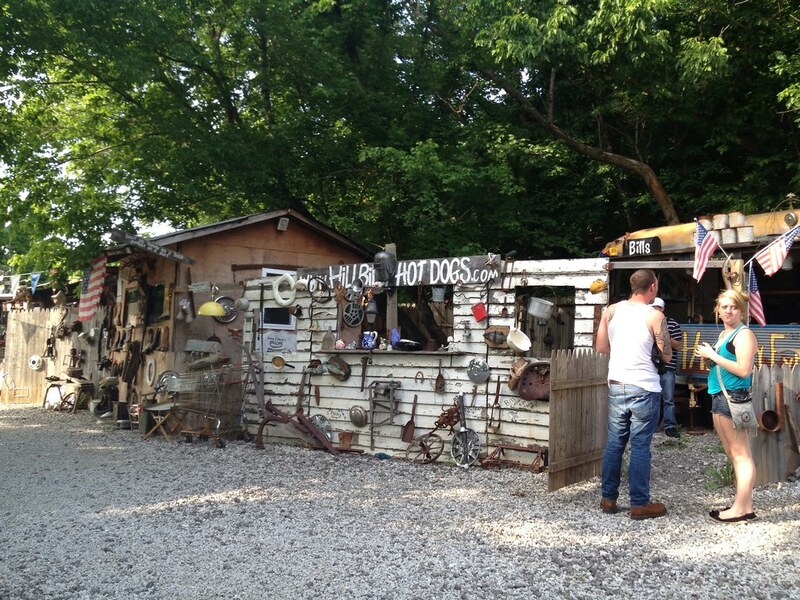 It looks like if you took a back road down some hollers, you would find old, rusted crap in someone's back yard. I can think of a few houses like this. Parking is kind of confusing, but it's just a large gravel lot with random piles of junk interspersed. So I think you can really just park wherever. 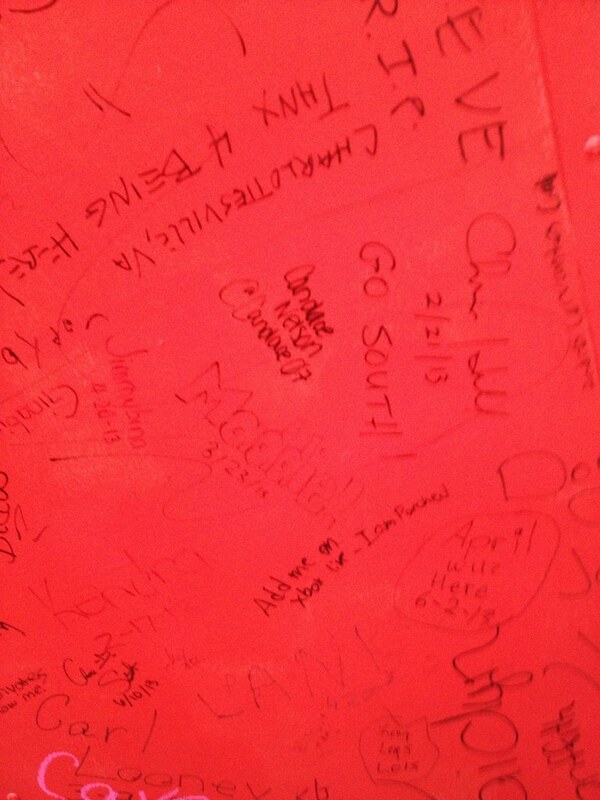 We made our way over the entrance, taking in some of the local "art." 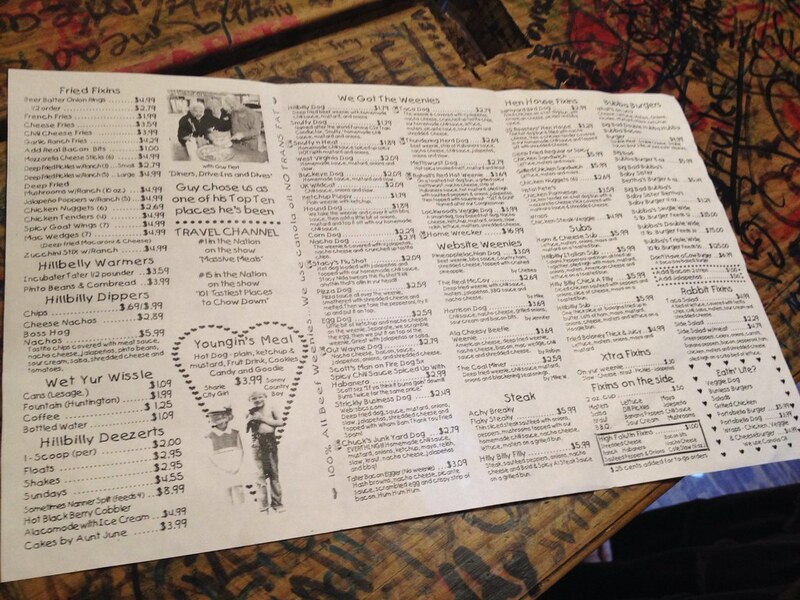 When you go in, there's a precarious line you form, and that's when there's a chance to glance over the menu. 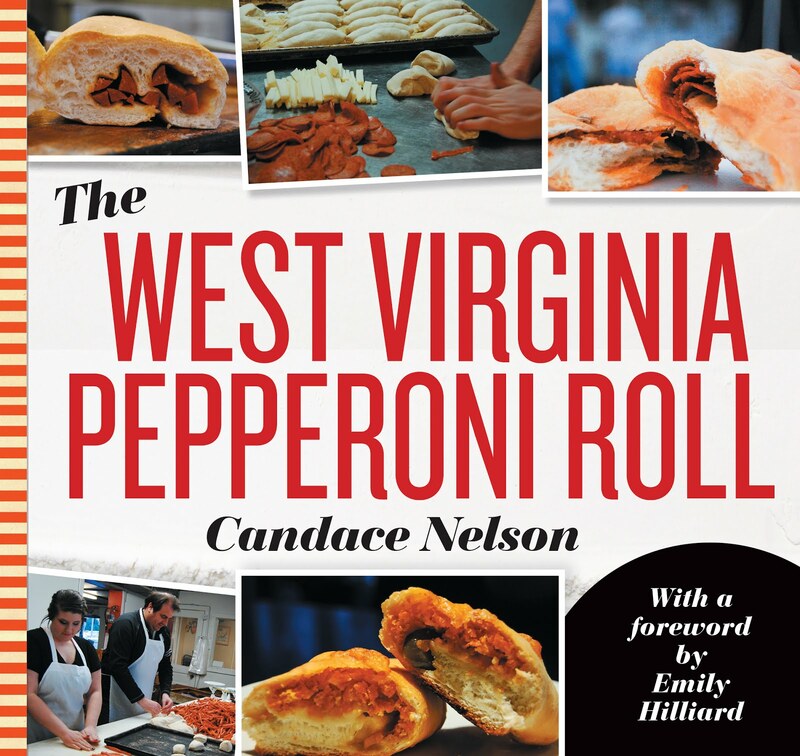 They feature more specialty dogs than traditional West Virginia dogs. They have things like a deep-friend hotdog, one with bbq sauce, another with egg, a pizza dog, and their famous "home wrecker," which is 15 inches and has tons of toppings. 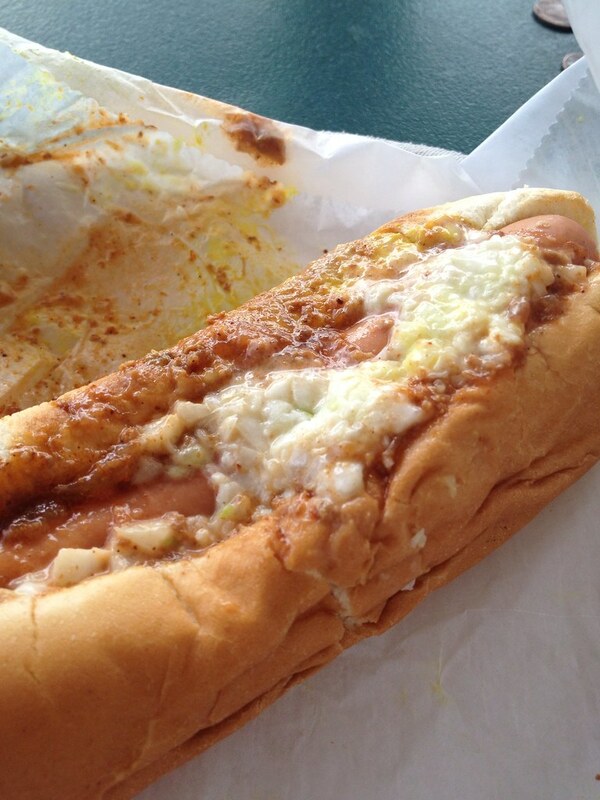 Being a native, I went with the "West Virginia Dog," which had sauce, mustard, onions and slaw. 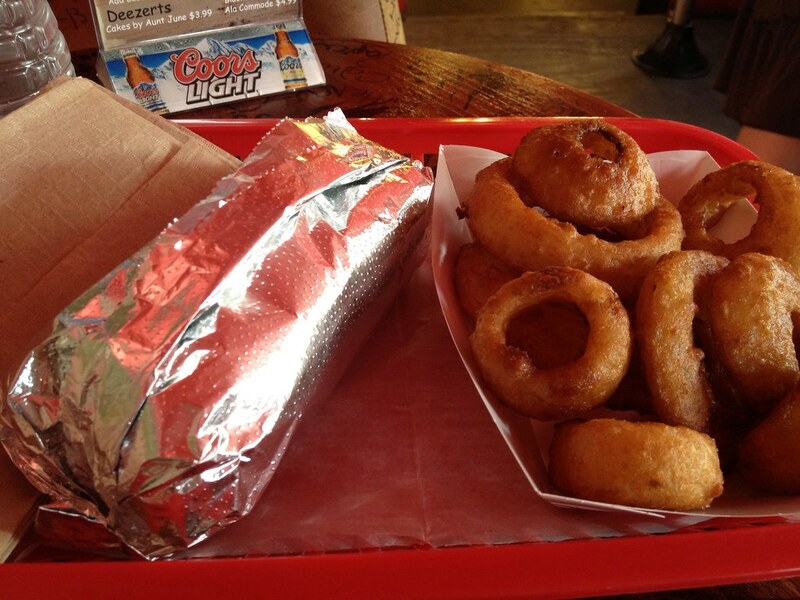 And a side of onion rings. They sing a "weenie song" when you tip. 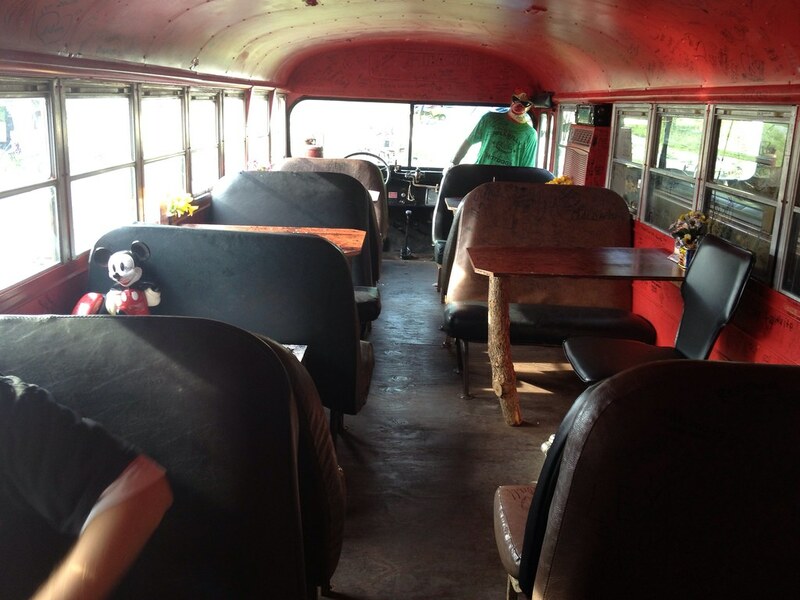 I paid and took my seat on the bus. 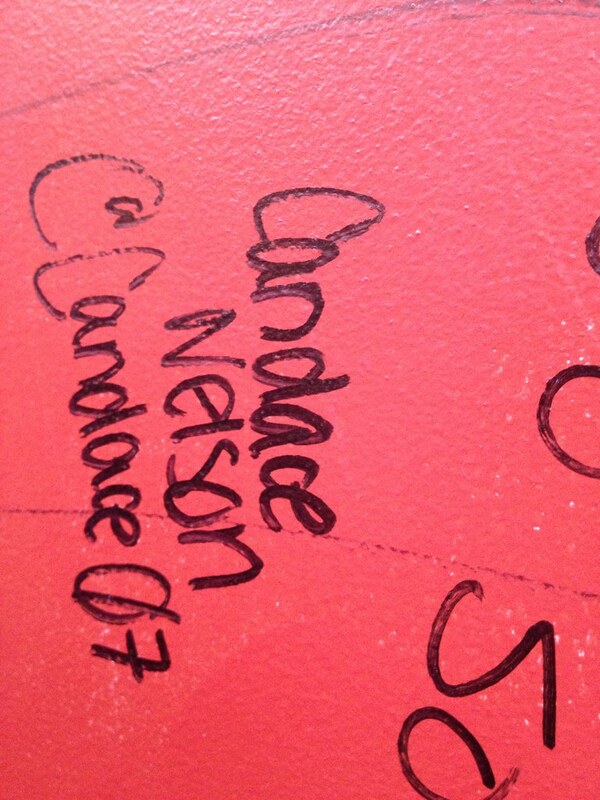 This bus has signatures all over it, so I had to add mine, of course. My friends and I waited for our hotdogs - one of whom got a homewrecker (they say "we've got a homeeeeeeeeeewreckerrrrrrrrr when it comes out. You can try to eat it in 12 minutes for a T-shirt, but this was just to-go) - for only a few minutes before they called our names. The thing is that this place is mostly operating off of gimmick - I think. And it's a fun gimmick. 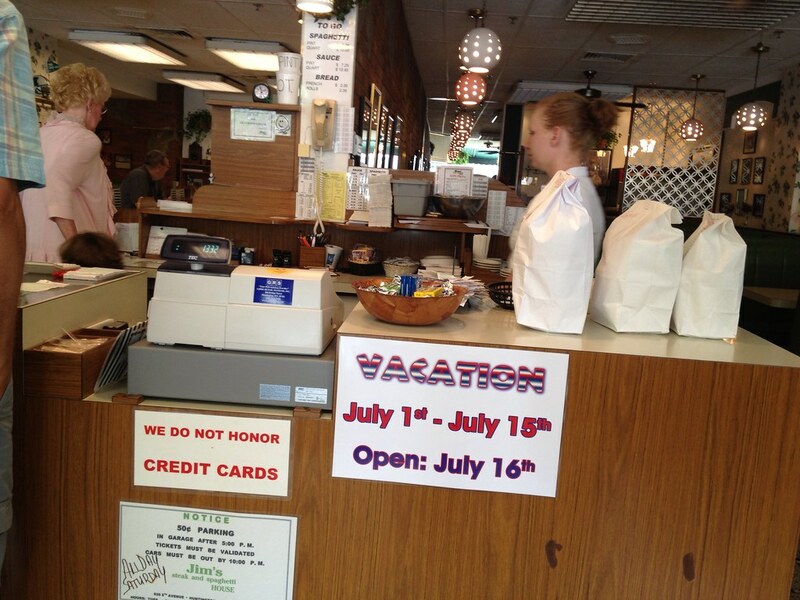 It capitalizes on a stereotype, and people love that stereotype and it's fulfilled for them when they come here. I just want some damn good food. The sauce wasn't super exciting. 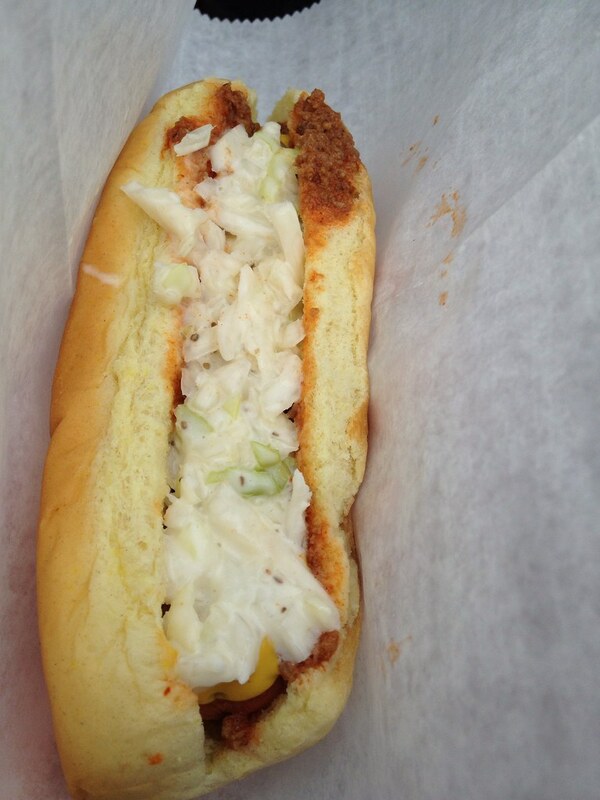 The slaw was more like picnic cole slaw - very piecey with large chunks, rather than a more cohesive thick sauce. 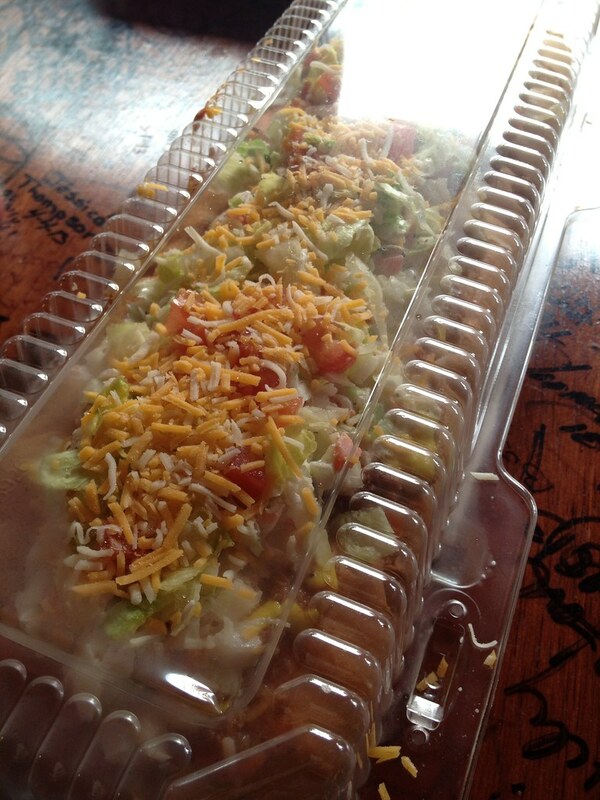 It kind of felt like I was eating a mini salad on top of a hotdog. Onion rings were pretty good - though I wish a homemade sauce accompanied it. That's where you see the truly authentic flair. Anybody can fry some frozen onion rings. But, really, the food is fine. It's fine. But people go here for the entertainment. I think I'm okay with that. 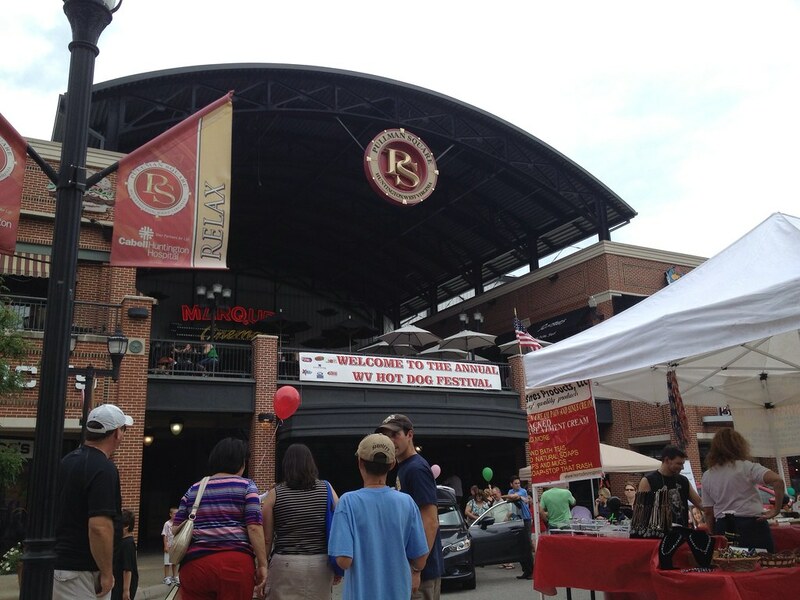 For my second visit to Huntington (non-worked related, which was once), I indulged in the Hot Dog Festival. In fact, this was the only reason I went to Huntington. This is the only reason I go most places. 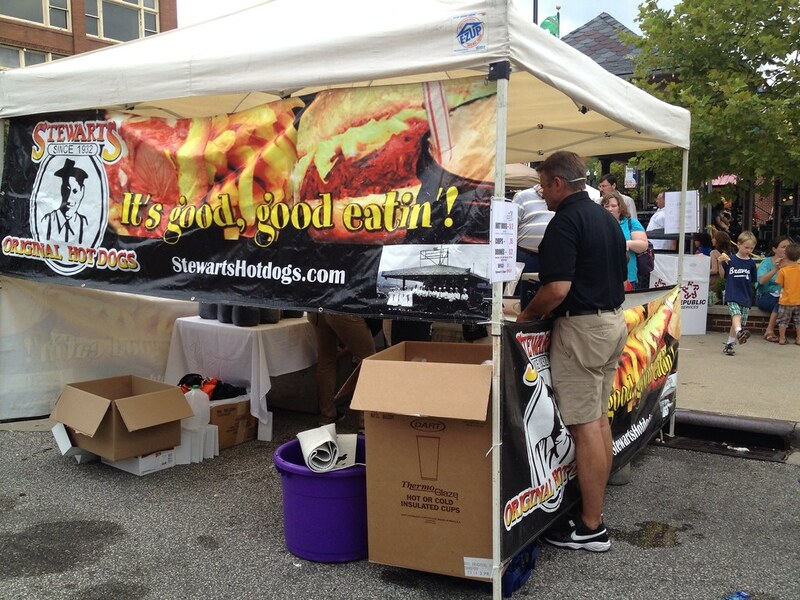 So the Hot Dog Festival had a handful of vendors: Stewarts Original Hot Dogs, Frostop Drive Inn, Midway Drive-In, Sam’s Hot Dogs, Charlie’sHarley Davidson Diner, Down Home Salads, and The Jug & Kilt English Pub. I don’t really know what that last half are, so I focused my efforts on the top four and prepared my stomach. For not knowing Huntington at all, I, remarkably, did not get lost and also found parking. For the whole day festival, I only paid $3 in parking for a garage that was RIGHT THERE. 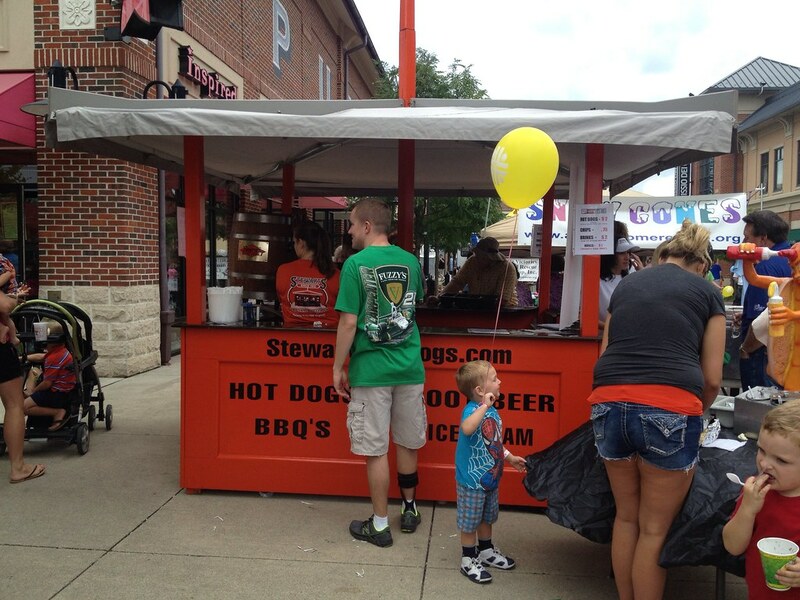 The very first hotdog I knew I wanted to try was Stewarts. I’m told that is iconic Huntington, so I didn’t want to risk running out of room before I tried it. Luckily, the area where my friend an I entered was right near Stewarts. 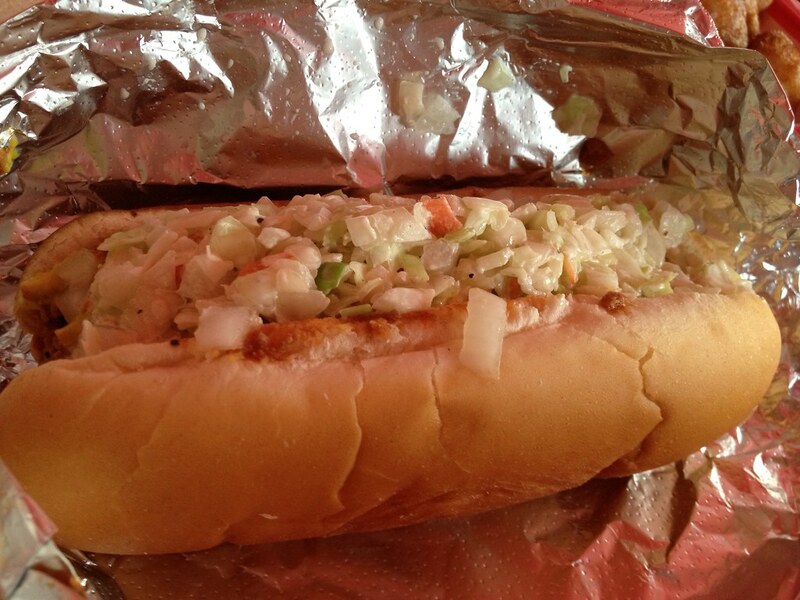 I ordered one dog - $2 – with chili, slaw, mustard and onions. They only fix the hotdog with chili and you supply the rest of the toppings (they also had ketchup available) from canisters on a communal table. 1 – This was me creating my own hotdog, so unless they do this at their restaurant, too, I didn’t feel as though I was fully evaluating their product. 2 – It was a little warm out, and these canisters were just sitting in the sunlight. I imagine slaw could go bad? 3 – I don’t like the idea of communal toppings. I don’t know what those people did to those toppings before I got there. They were just in canisters that were haphazardly closed or open, and it was just messy. When eating the hotdog, I was thinking “Okay, this isn’t bad.” I’m glad it was my first, because it got increasingly better as I went along. 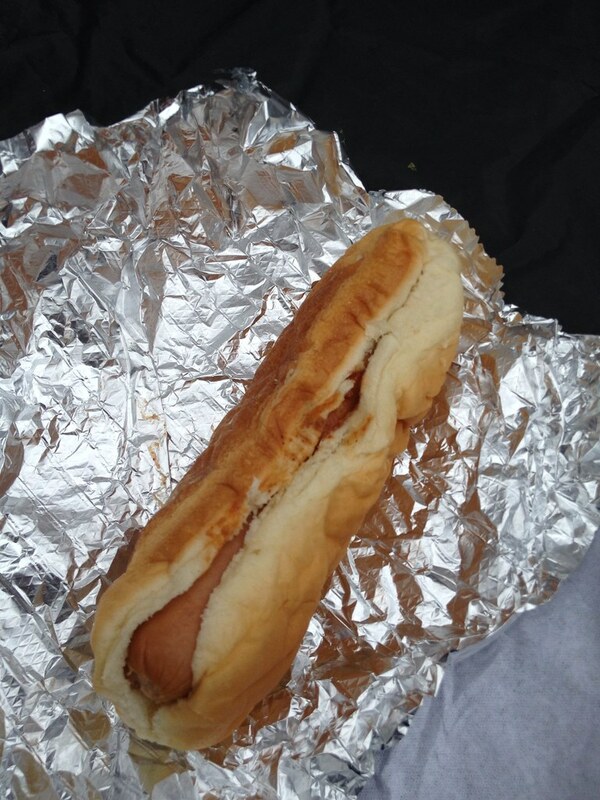 This was an average hotdog. 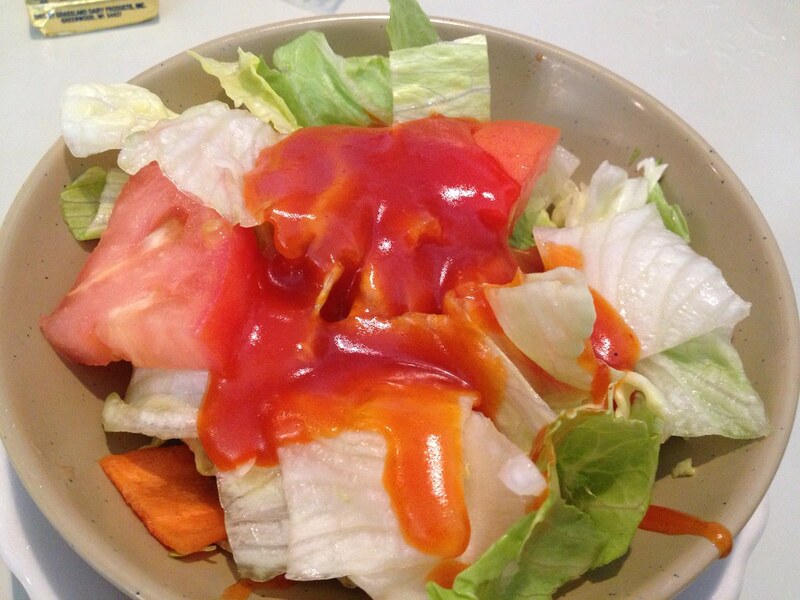 The sauce didn’t have a lot of flavor and was just overall blah. 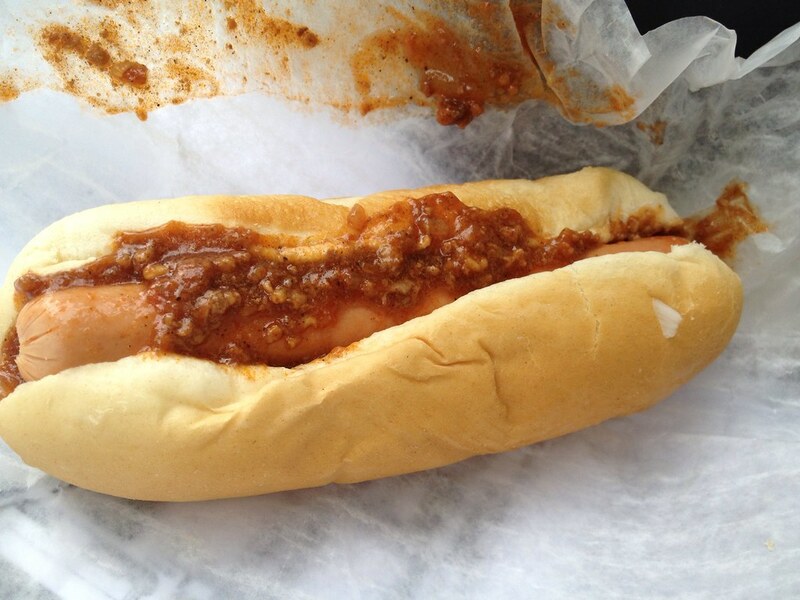 After watching some contests and perusing the shops, we tried our second hotdog: Midway Drive-In. 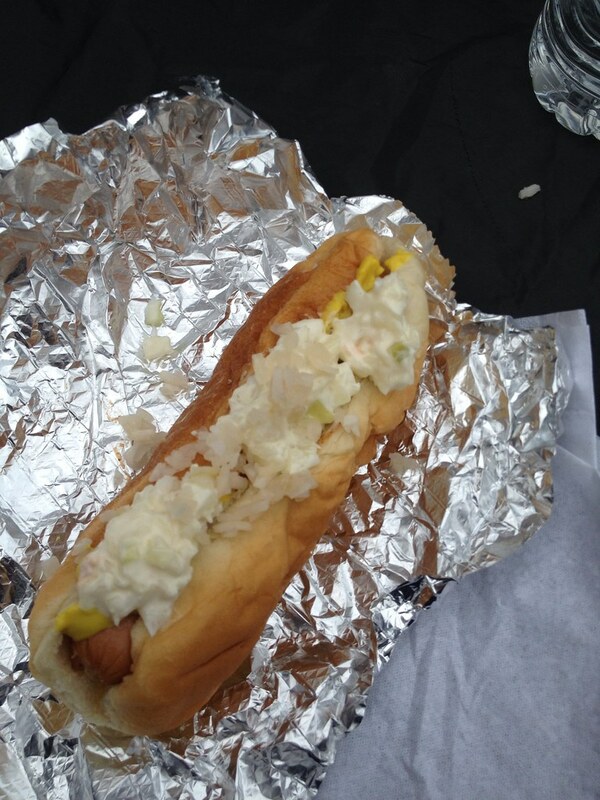 The hotdog was better than Stewarts – even though it didn’t have slaw. Still a notch above with slightly better tasting chili, and the toppings were fresher. Okay getting full. One more before we go: Sam’s. 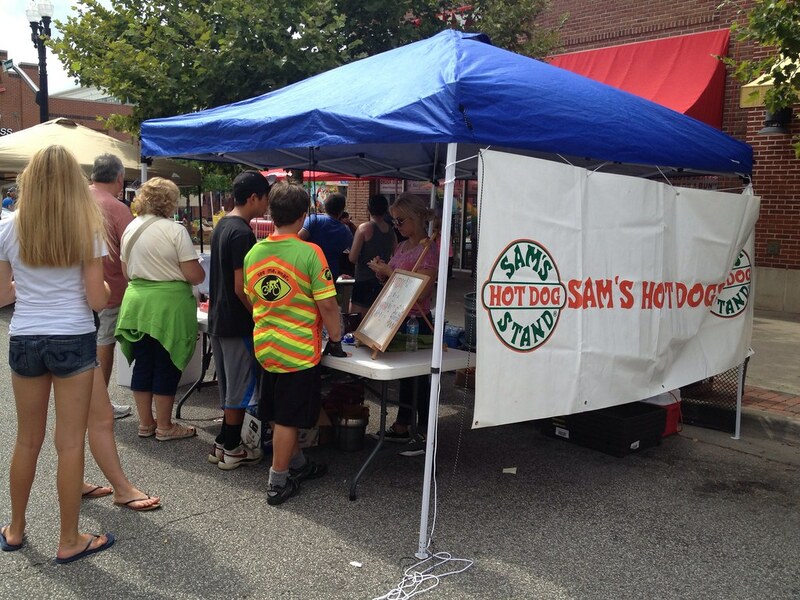 I have had Sam’s before in Charleston, so it was probably #4 out of the ones I wanted to try, but my friend and I saw Frostop coming to the festival, so we figured we could actually just go and sit there and save the festival for another one. 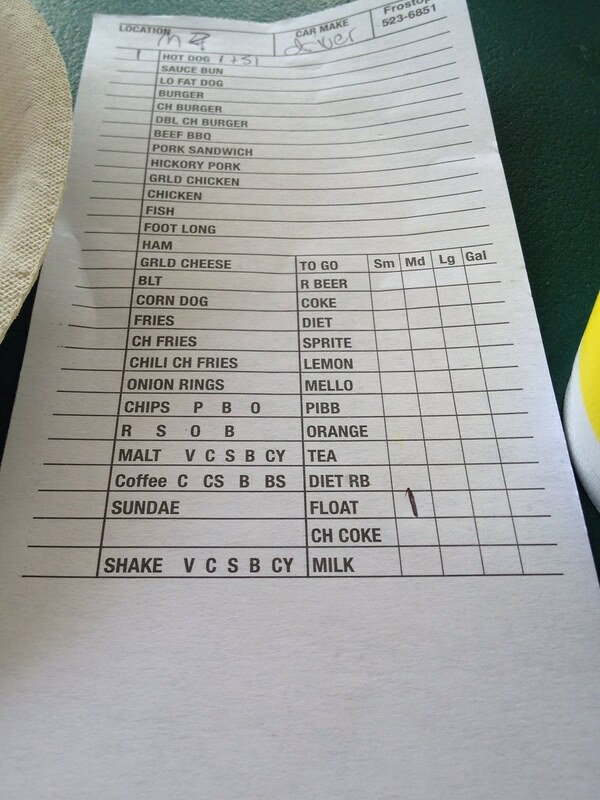 All of the hotdogs at this place were $2, so I asked for one standard. My friend was the last person to get chili. They had to shut down after us. What is it with these places running out of food? There were still a couple hours of the festival left to go! But I have to say, Sam’s nailed it. Bun was steamed right. 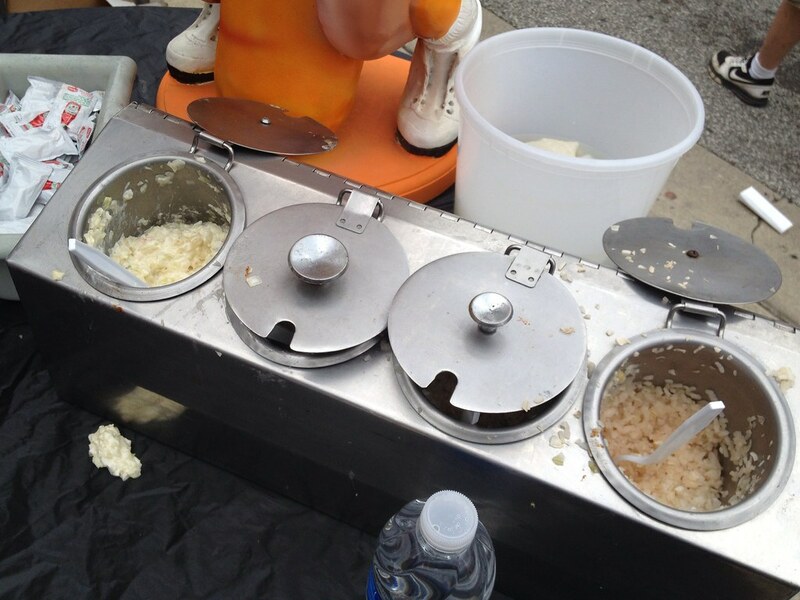 Sauce was the most flavorful, and toppings were fresh and cold. Before we left Huntington, we took another lap or two around the festival and headed out. 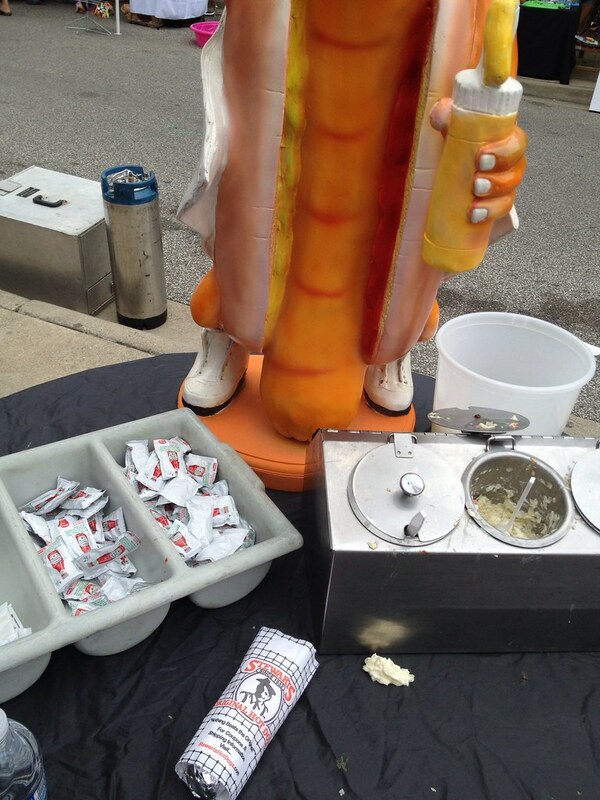 By this time, our three hotdogs had digested and we could take on a fourth. 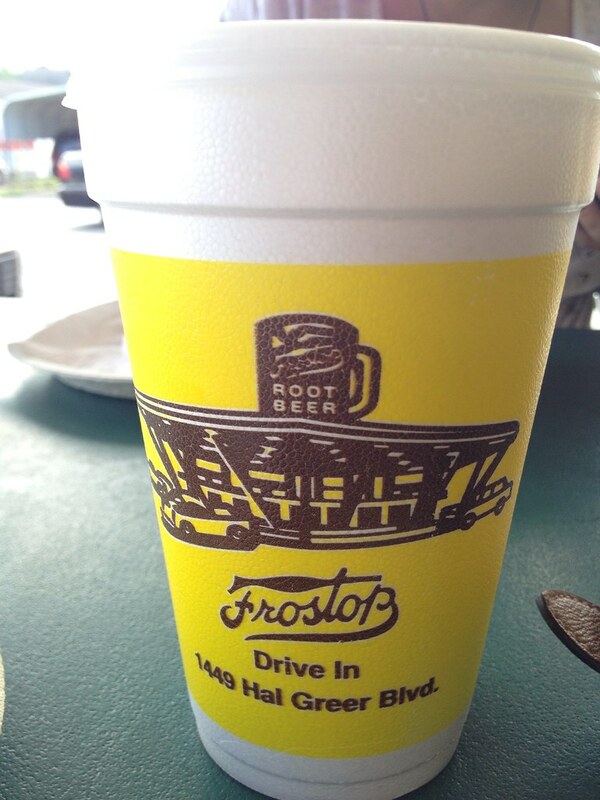 So we stopped at Frostop. You can’t miss it. 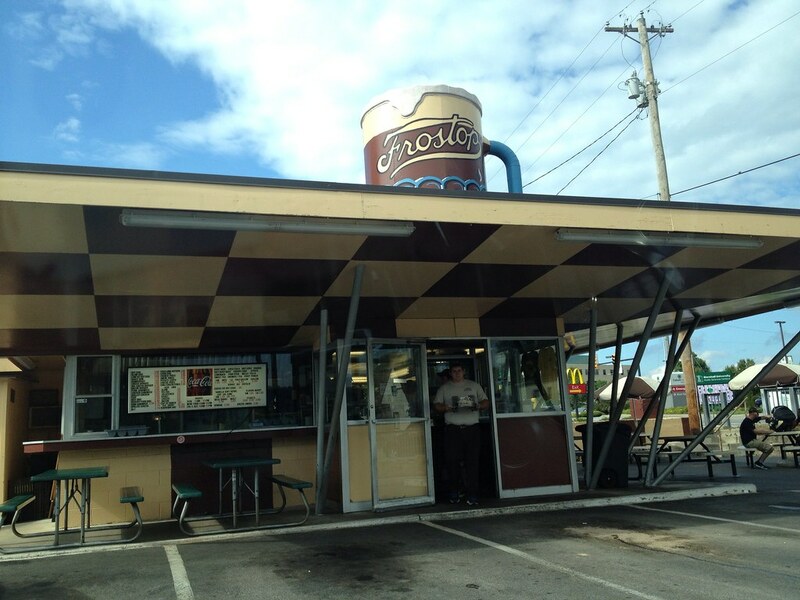 It has a giant, rotating root beer on the top. I pulled up, and clearly you are supposed to know what you want when you do this. As soon as I parked, a waiter – is that what they’re called? – came over to my car and asked what we wanted. I told him I have no clue. He told me I could pull up to the menu. 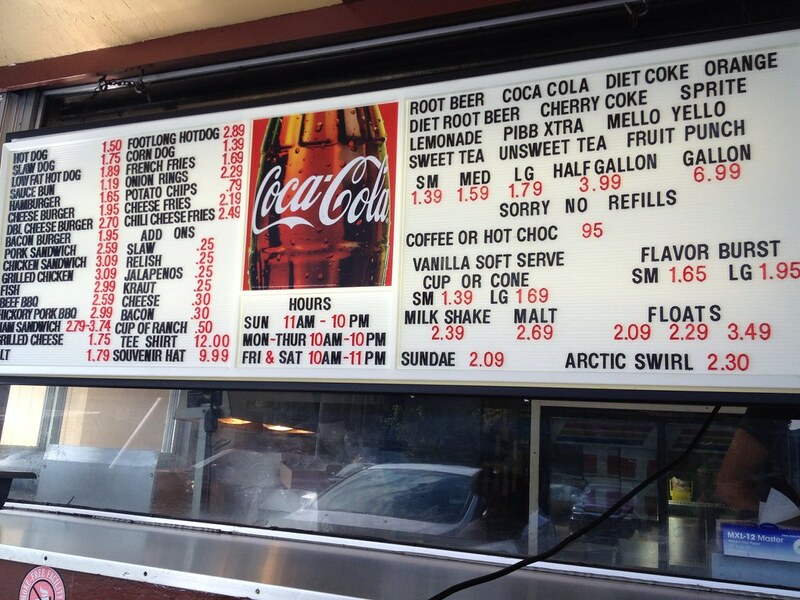 Looking over the menu at the front of the building, I decided on one hotdog and a rootbeer float. You actually have to pay extra for slaw. I then asked if we could sit outside. I didn’t want to eat inside my car. They have a few benches. 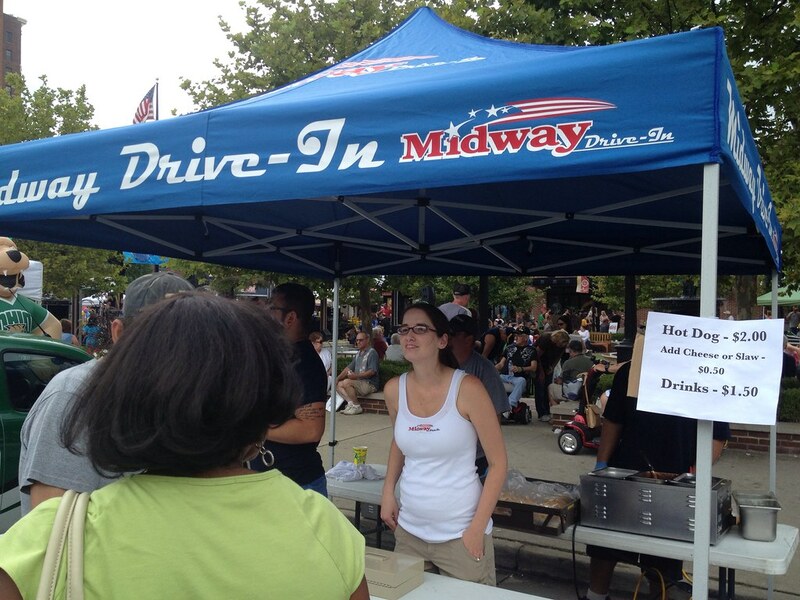 I was seriously not following drive inn protocol. Forgive my ignorance. After a bit, he came back with our food and a bill with change already made. He anticipated me paying with a $5. Which was presumptuous and slightly confusing. But I made it work, somehow. If you’re reading this, sorry, dude. Did NOT mean to make your job difficult. I’m just stupid, or something. Hotdog was good. To be honest, it wasn’t as memorable as the root beer float. So good. I don’t even like root beer. It doesn’t taste generic or all those other awful things pop can sometimes taste like. It was smooth and refreshing and amazing. And good GOD. Delicious. 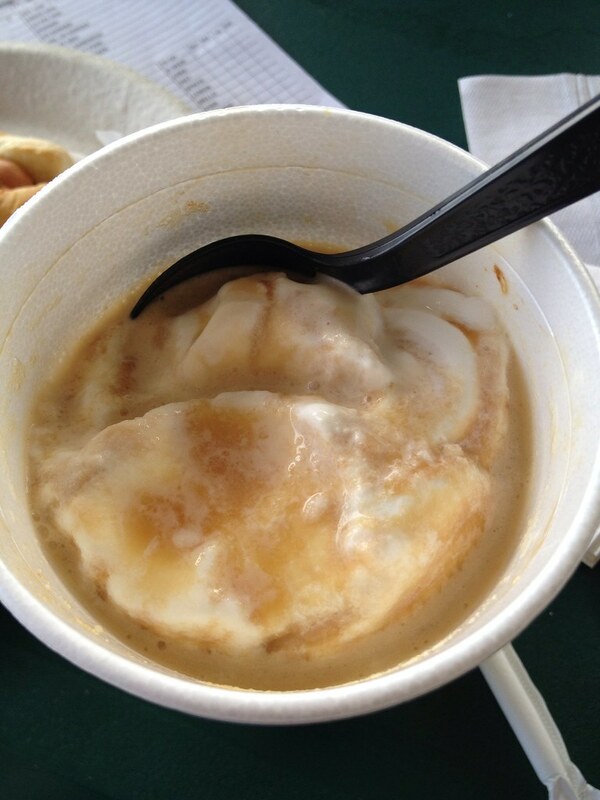 Get one of those root beer floats, and you can thank me later. But the hotdog? Eh. Just get two root beer floats. The Charleston Town Center Mall is one of the best - if not THE best - in West Virginia. It's huge and has most of my go-to stores. 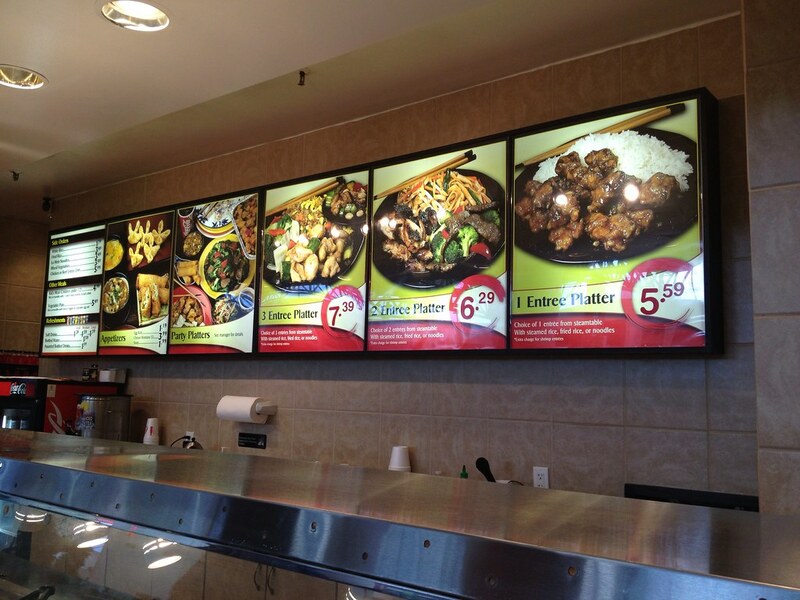 It also has a Chinese place in the food court - China Max! I know you all know my love for Chinese food, and while this isn't upscale, fine American-Chinese dining, but it is a great option for quickie American-Chinese food. 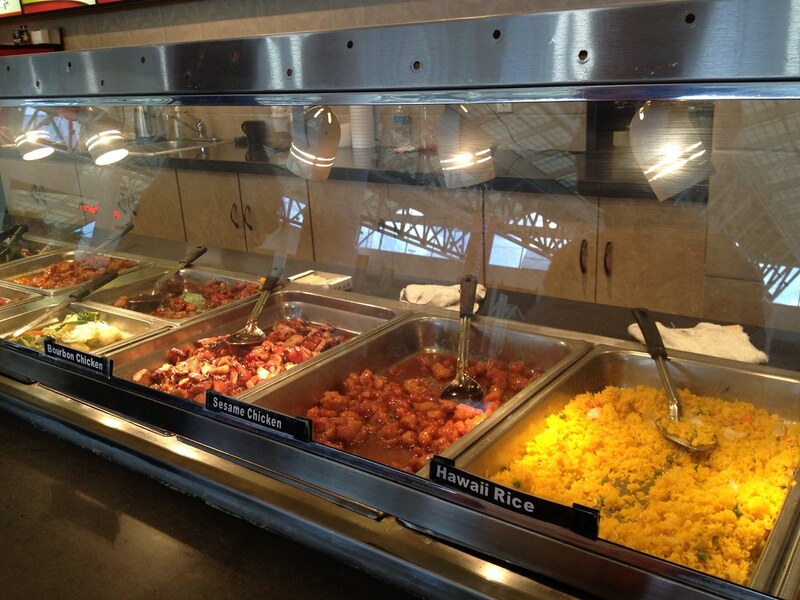 It's cafeteria-style in the sense that there are large trays of premade food kept hot, and you can choose what you like. I chose two different types - a honey type and a sweet/sour type. Both made with a thick, sweet, tangy sauce. Both quite tasty. Chicken was of good quality, with a nice crisp coating, covering in that thick sauce. I got a side of lo mein, which was fine quality. And a side of two crab rangoons - you can also get an eggroll - but nice they do these on the side rather than paying full appetizer price. 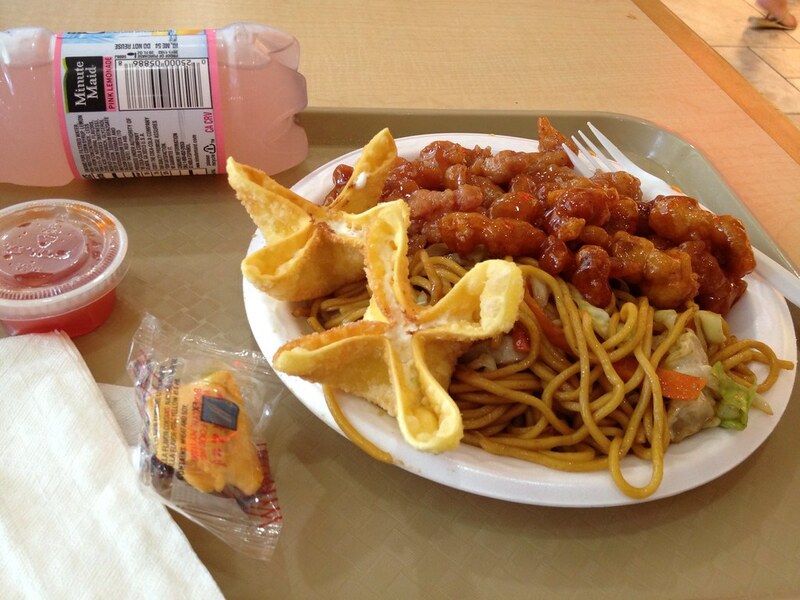 If you want good, quick Chinese food in the mall, this is a pretty good option. I've definitely had worse.